A big deal happened for me this week — I was featured in the “A Conversation With…” feature in the Wichita Eagle’s Sunday business section: http://bit.ly/9750Gz. I was flattered, flabbergasted and flushed. What would we talk about? The business reporter, Karen Shideler, was interested in my roles as a writer and PR counselor — and that of a farm wife. Karen is a pro and very easy to talk with, so it was a fun conversation. I greatly appreciated her take on my life here on Woolf Farms. The conversations after the Conversation have been just as fun. Two families are planning visits to our farm. I’m meeting with one soon-to-be ag journalist and connected with a colleague, who is also doing ag advocacy, on the ethanol front. Others sent notes detailing fond memories of their grandparents’ farms. 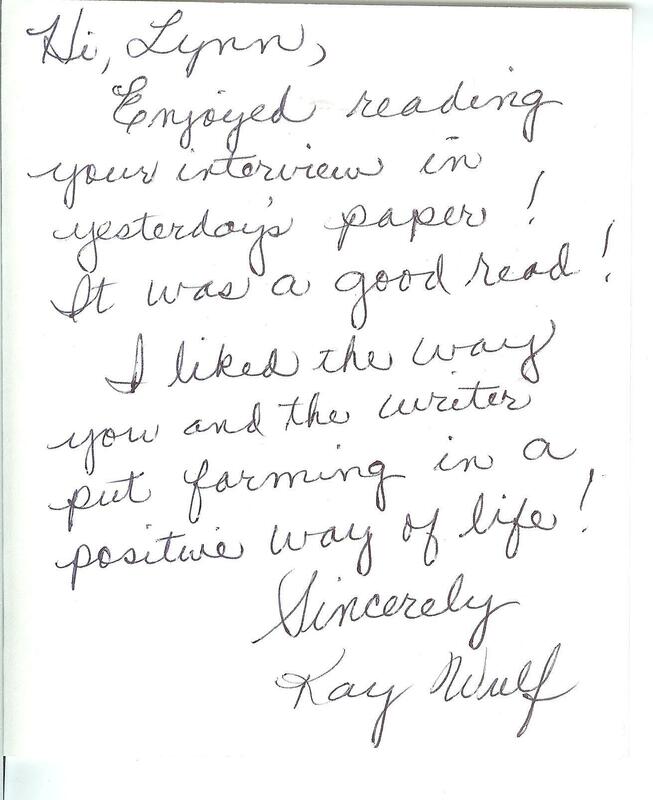 This note from retired schoolteacher and farm wife Kay Wulf made my day. Today’s Americans may be generations removed, but the family farm is still very much embedded in our culture. Let’s keep it that way.